Have you ever felt like your forehead has gotten wider and wider? As you age and your hair thins, that ever widening space between your eyebrows and your hairline can make you look and feel older. Are you ready to turn back time and get a more youthful look? Something called “forehead reduction” surgery can help. When hair loss occurs in either men or women, there is a tendency for the forehead to take on an elongated look. Men, however, have a joint problem with male pattern baldness; the thinning at the hairline and at the crown will eventually meet, causing one large, thinned or balding area as opposed to just the forehead. Women, on the other hand, lose hair differently. Their hair tends to thin in density all over, while the hairline recedes due to the tension placed on it by various hair styles. It is this particular problem that a forehead reduction can help. Wait! Isn’t That Plastic Surgery? Surgery? Yes; but not plastic surgery. Although Dr. Stong is a double board certified plastic surgeon, he also specializes in hair restoration. Forehead reduction surgery may sound like plastic surgery, but it’s really a specific hair restoration treatment. 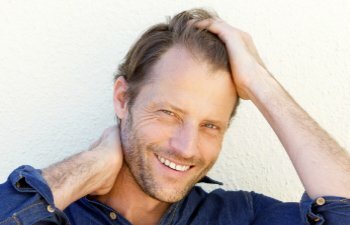 Using the Neograft system and his own special techniques, Dr. Stong is able to restore depth to the hairline, reducing the appearance of the forehead while subtly increasing density at the front of the hair. You don’t have to live with a wide and tall forehead. At Kalos Hair Transplant, we can help you get your hairline back! Call today to schedule a consultation!